Hello, is anyone there? Is this thing still on? Once again it's been a while. The last four weeks has just been an absolute blur of life. My birthday, a driving trip to Queensland for two weeks (which is 12 hours each way) plus of course Christmas. I have of course been painting my nails the whole time, and usually with some sort of quick and easy nail art, so I will endeavor to edit those photos and get them up on Instagram and the blog, even if they don't come with much commentary. Unfortunate I missed the December prompt from the Digital Dozen, it was during one of the weeks that I was in Queensland, and I didn't take enough nail art supplies with me to be able to paint the nail art prompts, not that I would have had the time anyway. Our trip was crazy busy doing theme parks, water parks, beaches and roller coasters for me to have any time to paint serious nail art. But I will be back with the January prompt too keep me on some sort of regular blogging schedule. Before writing up this blog post, I did a quick review of my Christmas blog from 2016. It was titled, Lisfranc, polish hauls and Christmas 2016. This time last year I was recovering from my Lisfranc foot surgery of having the plates and tightrope inserted into my foot. I had some complications after that surgery where my surgery wound spit open and it took months to heal. 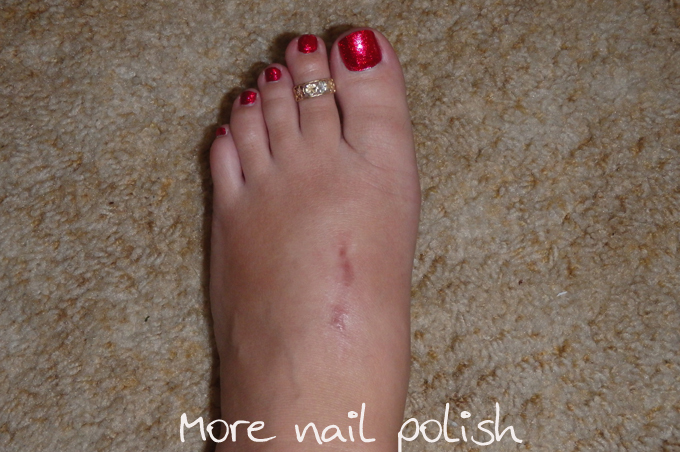 In March I had the second surgery to remove the metal plates (but keeping the tightrope permanently). The surgeon also did a scar revision to remove as much of the horrible purple scar that was left of my foot after the previous wound healed. Here is a photo of my foot now. It still swells up when I've been walking around a lot, and the purple scar is still visible, although much narrower than the original scar. I'm told I walk with a limp sometimes, but I don't notice and I generally don't have too much ongoing foot pain. But it's never going to be the same again. Amazing red nail polish on my toes does help though - thank you Lacquistry Redicilious. So polish hauls now, well actually I don't have anything to show yet. But my awesome local Aussie nail polish friends once again got me a voucher to get some polishes from Femme Fatale. I've have bunch in my cart already, but I'd love to know which polishes or collections were big standouts for you this year. Maybe I should just wait to see everyone's "top polishes of 2017" posts before I place my order. 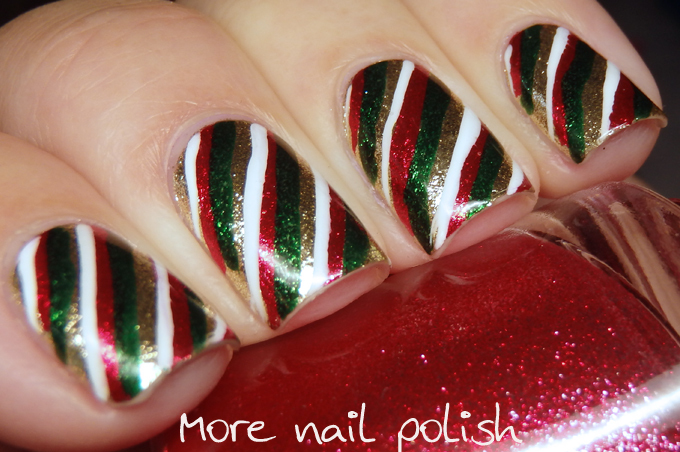 Now quickly to my Christmas nails. 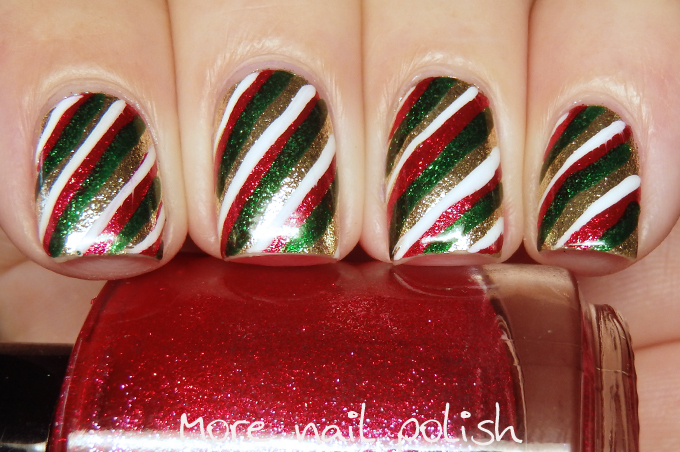 I originally wanted perfectly straight candy cane stripes, then I remembered how much I detest striping tape and how long it takes to do a multicolored mani, so instead I just painted free hand stripes. My base was Lacquistry Amazeballz Extra fine, the stripes are Redicilious and Inadverdant, and a white creme. I have missed wishing you all a Merry Christmas for 2017, but there is still time to wish you all a very happy new year for 2018.